In 1861, Ure described the smelting processes used in Swansea. The predominant ores were cupreous pyrites and “gangue” (iron ore or rock), containing nearly equal parts of sulphide of copper and sulphide of iron. 1. Calcination of the ore. The ores from various mines are mixed into a consistent mixture for the smelting process. By the calcining process a large proportion of the copper sulphides become copper oxides, exchanging sulphur and arsenic for oxygen. 2. Fusing of the calcined ore. The ore is mixed with slags or other fluxes and smelted. The slag is raked off when the smelt is complete, and a further charge of calcined ore is added and the process repeated. Further charges of calcined ore are added until the liquid matte at the bottom of the furnace reaches the level of the front of the furnace (level of the skimming bar). This normally takes two or three charges of ore. The matte is then drawn off at the tap hole and granulated by the process previously described at Anglesey. The granulated matte contains about 33% copper, the other principal components being iron and sulphur. The purpose of this second process is to make a fusible mass of the ore and other components, so that the ore settles by gravity beneath the slag, which can then be skimmed off. This fusibility is achieved by charging the furnace in the second process with slag derived from process 4. The slag from process 2 is often broken up and any rock containing copper ore is again smelted in a subsidiary process. Note that Lentin in 1800 does not describe the separation of the matte from the slag, except after the tapping process had been completed. The matte and the slag were then separated mechanically, rather than by gravity in a fluid state. 3. Calcination of coarse metal. The purpose of this process is to oxidise the iron content of the ore, which is now more easily achieved since the ore has been separated from the majority of the earthy substances. 4. Melting of calcined coarse metal. The matte is smelted with slag from process 7, which contains copper oxides. The oxygen and sulphur combine to produce sulphuric acid, leaving a purer form of copper. The slag from this process is used in process 2, while the matte is granulated (named “fine metal” by the smelters) or run into pigs or ingots (“blue metal”) with approximately 60% purity. 5. Calcination of fine metal (second matte). This is undertaken in the same way as process 3. 6. Melting calcined fine metal. This process is similar to process 2, which produced the first matte. The black copper produced is run into ingots for roasting. It contains from 70 to 80% pure copper. In many instances processes 5 and 6 have been omitted and the “blue metal” ingots or pigs go straight to the roasting stage described in process 7. 7. Roasting coarse copper. The purpose of this process is to oxidise the iron remaining in the copper. The temperature of the furnace is gradually increased so that the process is allowed to finish before the copper is melted and poured into ingots and known as blister copper, because of the oxygen that bubbles and escapes from the copper as it solidifies. The slag from this process is rich in copper oxides and together with the slags from processes 6 and 8 is reused in process 4. Sometimes the roasting is repeated up to four times, in which case the calcining and smelting of processes 5 and 6 are omitted. 8. Refining or toughening the copper. The pigs of copper are heated to a roasting temperature in a refining furnace to release the last impurities before the temperature was increased to melt the copper. Any final slag was skimmed off before the poling of the copper using branches of green wood. At all times the surface of the copper bath was kept covered with charcoal and stirred with the branches, so as to cause violent bubbling of the copper and the release of any remaining oxides. The product of this process was drawn off and moulded into ingots. In some difficult cases, lead was added to the copper to assist in refining. The processes described by Ure are similar to those described by Jones in 1847 at Anglesey. 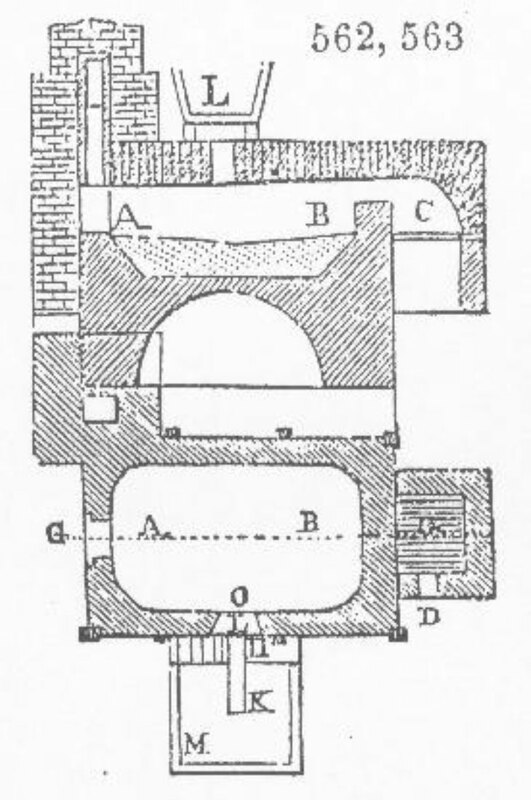 A smelting furnace, typical of those used at Swansea, South Wales, c.1861 (Ure’s Dictionary of Arts, Manufacture and Mines. London. 1861: 823).